Our dedicated therapy team offers a staff-to-resident ratio of 1.8 to 1, meaning an unparalleled level of personal attention to each individual. 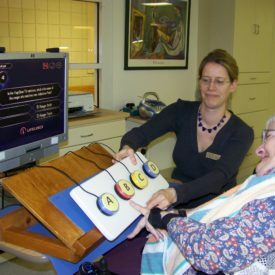 We provide a variety of therapy programs designed to help each resident maintain (or attain) as much independence and autonomy as possible. Our Occupational Therapist and her team help maintain and improve function for residents. Services include provision and maintenance of splints, adaptive feeding equipment, assistive technologies, fall prevention devices, low-vision aids, and adding adaptations to make life easier. Our aim is to reduce pain or limitations in movement, improve physical function, and to promote general well-being by increasing residents’ awareness of themselves and by expanding their functional movement. 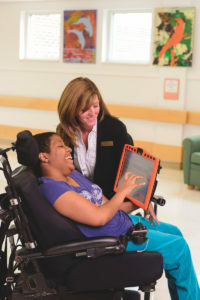 Our speech therapy department strives to help individuals connect and communicate, and give them a voice for self-expression. 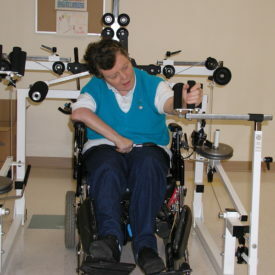 Through therapeutic techniques and state-of-the-art voice output machines, residents are able to express themselves to friends, family, and staff. In addition to communication, our speech therapy team help individuals who have difficulty chewing or swallowing during meals by providing therapy, staff and family education, and altering diets. They also provide cognitive training in the areas of memory, attention, reasoning and judgment. The Home also coordinates with an orthotist who evaluates residents for specialized shoes and braces. From a swim in the pool to coffee with friends, recreation and leisure is part of a healthy and happy lifestyle. 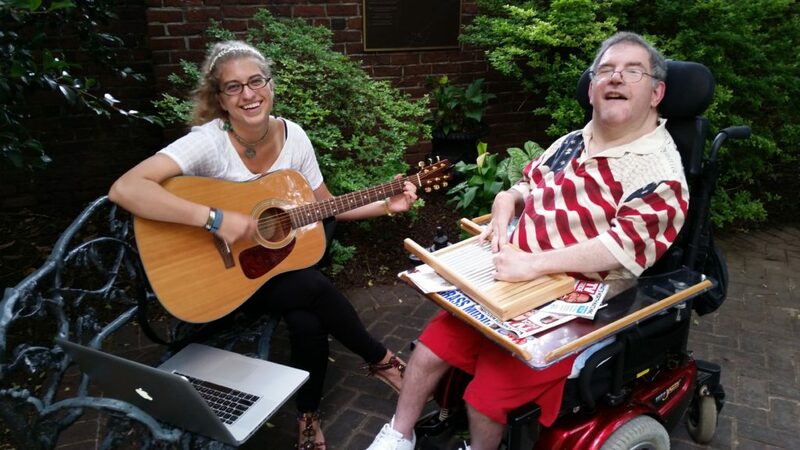 Our recreation therapy team, led by Certified Therapeutic Recreation Specialists and a Board-Certified Music Therapist, break down barriers to leisure by providing social, cognitive, physical, and environmental adaptations so that each resident can pursue his or her unique interests.